So much of our Identity has been defined by what we do, what we look like, and whether or not we've been deemed "successful." Often times our value and worth hinge on what other people think or feel. How can one expect to figure out who they are when society constantly changes? We must face the problem head on...with help of course. ​​​Most of us come up against adversity. Sometimes a lot of it. Since we're smart capable people we search for answers...but which ones are right? How do we know? And why does it seem like we get stuck while others perservere? There's a lot of self help out there. ​5 ways to get over a breakup... 10 ways to feel better about yourself... Be happy in 2 weeks! A few years ago I realized something. We can't "just get over it" and pretend our past didn't harm us nor can we make ourselves powerful because some book says so. We can't lie to ourselves and put on a good mask because it's easier than sitting in our mess for a season or because it's uncomfortable for other people to watch us in our grief. We've got to make the choice to walk through it. And that's where Identity comes in. Identity breaks down life lessons. It's basically an inner healing class and a life skills class decided to have a baby. I know...professional description right?!? It's true. We talk about it all. We don't navigate around things. We walk through them together. We struggle...we say it. We have fears...we say it. We have questions...we ask them. If you're looking for a class that will have all the answers PLEASE. LET. ME. KNOW. WHEN. YOU. FIND. IT. And sign me up! Life is messy. There's no quick fix or a book that is going to convince you that whatever is ailing you in going to be fixed in 2 weeks. If they promise it it's just a gimmick and you should move on. I've designed Identity to be 10 weeks because it takes most of us a good chunk of time to get into a new rhythm and we need to catch our barrings. We talk about perfection, grace, forgivness, relinquishment, rejection, rebellion, self worth, inappropriate authorites, boundaries, shame, guilt, our soul, our beliefs... you name it. These are big subjects. We need the time to process it all so it will have a lasting lifelong impact. ​​​​​​You my friend are on an adventure. It's called life. Sometimes it seems fun and sometimes it seems like "what's the point?" Either way you're in it. I wanna help you make the best out of it all. You want to fill that voice inside you that says, "I CAN DO THIS!" 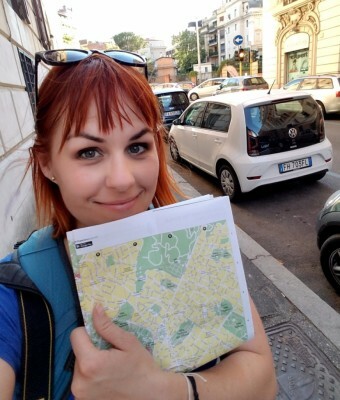 *This is me...clutching onto my map while backpacking through Europe in the summer of 2017. I had no idea where I was most of the time, I didn't speak the language, and I had to figure out social cues, cultural norms, and keep myself safe all while being on the adventure of a lifetime. You: Why is it so hard to get to the place I'm going? Because most of us have been taught that achieving success means making everything okay and just moving on without processing the past. You: Why do I fail? Because our heart needs tending to and the respect it deserves by not pretending everything is okay. We have to go through the pain and process. We can't just go around it. We can't pretend. You: What if I don't have a painful past. Can I still learn some things? Absolutely! I'm a life long learner and I think taking the time to learn new skills and information will be extremely helpful in any stage of life. You will have a lot of takeaways, my friend. You: How to I get back up again? With the help of someone who has been there before. It's important to have a guide.